KOTA KINABALU: In conjunction with the birthday of Tun Dr Mahathir today, UNICEF is releasing #lettertomyPM, a compilation of messages written by children after the 14th General Election. In their letters, children from across the country, including Sabah and Sarawak, share their aspirations, concerns, and propose solutions for #MalaysiaBaru in relation to the education system, peace, governance, unity, sustainable cities and the environment. “I will try my hardest to be a responsible citizen. I do believe that without being one, all of those amazing goals to make this country a better place wouldn’t happen. The youth need to realise how important their role is to reach those goals. I do believe that every person can make a change. As long as we all are in this together (and) unite for better things, no matter our different perceptions about things…The ultimate goal is always peace.” – Ana, 20, from Sabah. “I pray that you live a long and blessed life. Congrats on being the new Prime Minister and I wish that you have the courage to face any difficulties and have faith in what you are achieving. “More concern for poor people. “Improve transportation, fix the potholes on the road, and repair school buildings so students have a better place to study.” – Venice, 16. “Thank you for giving us justice … You are our hero!!! #MYHERO” – Hayden, 11. “To our wonderful PM: Thank you for protecting our Malaysia! Thank you for not giving up on our Malaysia! I hope you live happily and strong so you can continue to protect our country. May God bless you.” – Rachel, 11. “Dear Tun Mahathir, I want to thank you for your services. “Please help children by helping them (get) a better school. I find most of the schools which are far from the city are really in need of a great building for their school so that they can learn in a comfortable environment.” – Ezra, 15. “I know you can improve our education skills.” – Nazifah, 14. “I just hope that Sabah will have the same level in everybody’s view, (and will) be accepted and respected and grow together as 1Malaysia.” – Carina, 17. “I want peace in my country. Let Malaysia not become a racist country and let Malaysians stand together. May all Malaysians love each other.” – Amesha, 19. 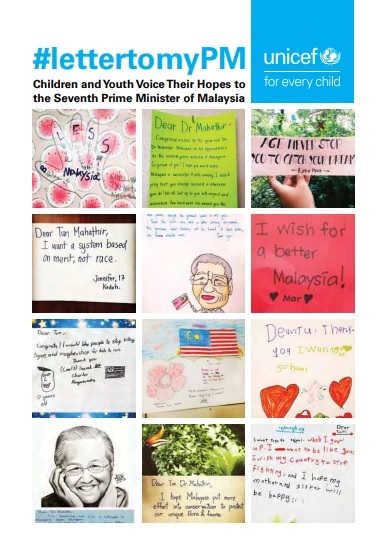 In commemoration of Tun Mahathir’s recent election as the seventh Prime Minister of Malaysia, UNICEF initiated the #lettertomyPM campaign on Instagram to give children and youth in Malaysia an opportunity to speak and be heard about issues that matter to them. These letters bring to light the children’s expressions of faith, hope and belief not just for a better country but also for a bright future. “We hope that when leaders enact new policies, they will be guided by the vision of these young people for the future of Malaysia,” said Marianne Clark-Hattingh, UNICEF Representative in Malaysia. In total, UNICEF has received more than 350 letters from children of different backgrounds; some living with disability, some undocumented as well as children from refugee communities. Providing space for children and youth to share their concerns and ideas upholds Article 12 of the Convention on the Rights of the Child; children must be given the opportunity to express their views in all matters affecting them and their opinions should be given “due weight in accordance with the age and maturity of the child”.